Mint Edition, the first offspring of Mint Julep MLF and Arno van het Nieshof, followed in her mother’s footsteps. She was 1st place senior weanling pleasure filly at the 2005 GLHA Futurity. As a yearling, she was the first place pleasure yearling filly at the 2006 AHR National show. In 2007, Mint Edition won 1st place in BOTH the GLHA and AHR Futurity 2-year-old pleasure halter classes. 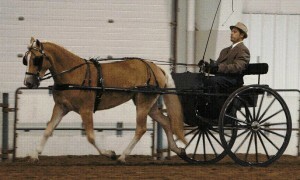 She also won 2nd place in both the GLHA and AHR Futurity 2-year-old pleasure driving classes. In 2008, Mint Edition won 1st place in the AHR National Futurity 3-year-old Mare halter class, going on to be named the ‘Reserve Champion 3-year-old’. At the GLHA Futurity, Mint was the 1st place 3-year-old mare. That same year, Mint Edition was AHR classified as high silver with 77 points. Mint Edition was bred to our imported, AHR Gold Classified and 2-time AHR ‘National Champion Stallion’, Alfa of Genesis, for a 2009 foal. We were quite excited about this cross because the pedigree of the resulting offspring would include two of Genesis Farm’s premier foundation horses–the great producing mare, Mint Julep MLF, and Arno himself, who bears no other formal introduction. Mint Edition’s bloodlines once again proved themselves with the birth of her first colt from this potent cross. The colt, Alakazahm, was shown successfully by Charlotte Ridge Haflinger Farm at the 2009 AHR Futurity. The colt was the 1st place Senior Weanling Colt and he then went on to be named the ‘Reserve Senior Champion Pleasure Weanling’. In the prestigious AHR Futurity S.I.P. class, out of 26 eligible pleasure foals, Alakazahm placed 3rd overall. Alakazahm has been gelded and will join the performance training program at Charlotte Ridge Haflinger Farm. Mint Edition was bred back to our AHR Gold Classified and 2-time AHR ‘National Champion Stallion’, Alfa of Genesis for a 2010 foal. This May colt, “Attn to Detail of Genesis” promises to be become something spectacular given the strong tradition of winning that comes from both of his parents and then both of his grandparents, too!